How Do I Specialize A Teaching Degree In A Foreign Language? 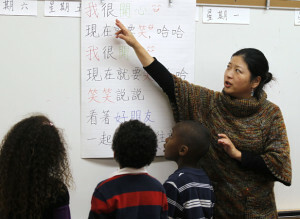 While there will always been a need for highly qualified teachers, budgetary cuts at many districts have seen many language teachers looking to specialize a teaching degree in a foreign language as a way to retain the marketable value amid a downturn in salaries, hiring, and retention. This is actually something that has happened across virtually every teaching position, with many teachers looking to put their skills to use in new ways so that they can navigate cutbacks successfully while meeting new student needs and state standards. Within the foreign language teaching profession, there are actually several ways to specialize that can make these educators a renewed asset to their district or private institution of choice. One of the fastest-growing areas within both language and foreign language education is English as a Second Language. Known commonly as ESL, this particular profession sees the teacher work almost as a translator, working with students whose first language is not English and guiding them toward proficiency. Though this job was typically done in the past by uncertified professionals, growth in this area and a demand for specialized instruction has changed requirements. Foreign language teachers have a significant advantage in this area: They likely already speak one foreign language fluently, though many language teachers can speak several languages effortlessly due to their advanced education. That means the certification serves only as a way for them to learn how to properly convey English concepts to a foreign-language learner in a classroom setting. This advanced study of ESL education results in a certificate from the awarding institution, which qualifies the teacher for the ETS Praxis examination for ESL instruction or language teaching, according to the Educational Testing Service. Increasingly, teachers are looking to dual certification as a way to expand their horizons, teach an engaging slate of classes each year, and maintain viability in the classroom even as state standards and educational objectives change over time. Foreign language teachers have a unique advantage in this area: Their studies of the foreign language itself were often paired with cultural and historical studies during their time in college and in grad school. They already have sufficient context for teaching in this area, and require only a bit of extra coursework and a new certification. For teachers looking to expand their certifications to take advantage of previous studies into culture and history, most states will allow completion of a certificate program that teaches the core competencies of history, culture, and related classroom objectives. Similar certificate programs are also offered for additional foreign languages. Since many schools focus on the “romance” languages, it’s generally relatively easy for foreign language teachers to pick up skills in Italian, French, Spanish, Portuguese, and Latin. This, in turn, turns the teacher into a foreign language expert that can work within all levels of the school, instead of a language teacher in only one subject. Whether it’s focusing on English as a Second Language, remedial foreign language services, or even diversification into new languages that are taught in a given school district, today’s educators have some great options available to them. In an environment where increased sophistication is preferred, it’s time for today’s teachers to consider the numerous ways that they could specialize a teaching degree in a foreign language to be compatible with current and future educational objectives.